Crystal Palace forward Wilfried Zaha is back in training ahead of Saturday's Premier League trip to Huddersfield Town, manager Roy Hodgson said on Thursday. 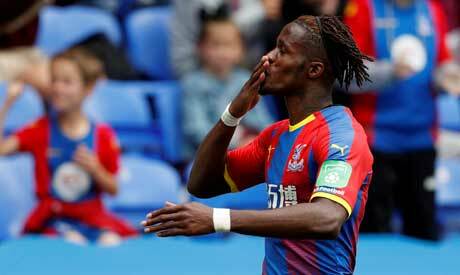 Zaha missed Palace's 2-0 defeat by Southampton in the league before the international break with a groin strain but could return to the squad this weekend. "It was Wilf's first training session today," Hodgson told a news conference. "It was debated whether he should join in, but he was determined to. We will have to see how tomorrow pans out before we decide how we play on Saturday." Zaha's importance to Crystal Palace is underlined by the fact that they last won without him in September 2016. "Until such time as we do win a game, Wilf can sit there knowing he is the man we need to play," Hodgson added. Hodgson confirmed James Tomkins has recovered from his calf issue but striker Christian Benteke will be sidelined with a "niggling knee injury" which resurfaced on international duty with Belgium. "We have played well against some of the top teams," he said. "I don't personally subscribe to the theory we can only do it against the bottom teams. We have been close against the top teams, and we are capable of giving those performances." David Wagner's Huddersfield are searching for their first league win in nine games after losing four and drawing four.